The Girlfriend Bracket is coming back! In 2013, I played a little game on the interwebs called The Girlfriend Bracket. Back then it was just for fun and just to test an idea I had about a possible “reality TV” dating show I was thinking about producing on YouTube. Interest in the game completely overwhelmed my expectations (despite the fact that I barely promoted it). And why not? It is a fun, harmless game that lets people play “matchmaker” by voting in weekly matchups about which celebrity would make the best fake girlfriend for yours truly – and the stakes couldn’t be lower… It is a fake game show for a fake girlfriend – all in good fun. Evangeline Lilly won in 2013 and was a real good sport about the whole thing. 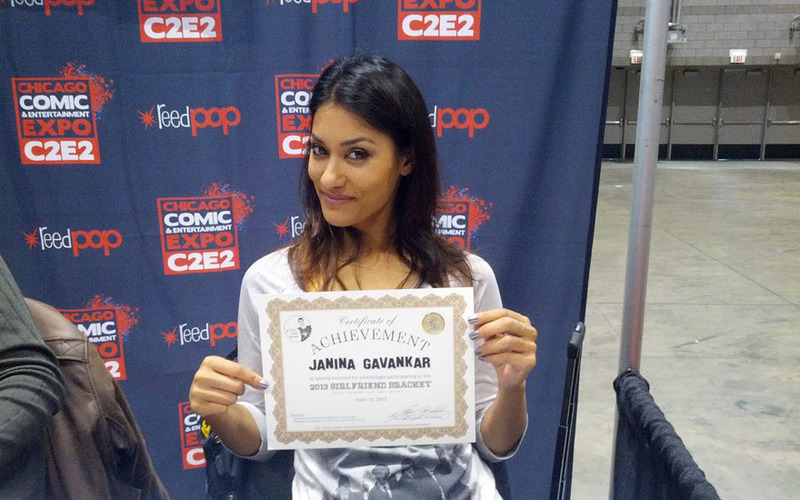 I even gifted “unwitting participants” Janina Gavankar and Felicia Day with some cheesy certificates of participation and got them to pose for pictures with their consolation prizes. This year, I am going to relaunch The Girlfriend Bracket as a charity fundraiser. I’m creating a whole separate website for it, and I’m asking celebrity participants to promote the rounds they compete in on social media. The game is simple: 64 women compete in weekly matchups (like a March Madness bracket) and every week someone is eliminated (like The Bachelorette) decided on entirely by audience votes (like American Idol). Can you see the appeal? Right now, I’m looking at raising money for a few charities including Donors Choose, Doug Flutie Foundation for Autism, and two more charities yet to be determined. I’m asking the reigning champion, Evangeline Lilly, to select one of the charities. Upon voting for a favorite in each matchup, voters will be asked to pledge $1 to the featured charity of that matchup’s conference. Donations will not be mandatory for voting, but I’m hoping a little social pressure can go a long way towards raising some awareness and funds for some very worthy causes. The more we can promote the weekly matchups, the more money we can presumably raise for charity. That is why, unlike in 2013 where the 64 participants were sort of drafted without their consent and had no idea they were even in a contest at first, this year I want all participants to be aware ahead of time that the game is on so that they can play as willing participants and help promote it. I’m sending the word out to just over 120 eligible female celebrities via Twitter. There are only 64 slots available and I really want to fill all 64 spots with eager participants. So, if you are reading this and I invited you to participate, I really would encourage you to consider playing. Everyone else reading this, maybe a little social pressure wouldn’t hurt: Invite one of the invitees to play in the 2016 Girlfriend Bracket and help raise funds and awareness for a few worthy causes. I will post a list of all the invited participants and their response status just as soon as I get the official Girlfriend Bracket website up and running. In the meantime, follow me on Twitter – @wiedepedia – or the official hashtag – #thegirlfriendbracket – to keep up with who is invited and what the buzz is. And that is basically it. Hopefully, we can put together a fun little game, get some attention for some of my favorite female actresses and musicians, and ultimately raise a nice chunk of change for some great causes. Before you share this and then go about your day, please make sure you sign up to receive email updates about the contest. Your email won’t be shared or used for any other purpose than to send information about official Girlfriend Bracket news. And I guess I shouldn’t assume you’re automatically going to share this as well, so I’m asking you here and now: Please help get the word out a much as possible and share this post on social media. Thank you so much!